In a mixing bowl, combine all the dry ingredients - APF,corn flour,salt,baking powder n baking soda and keep aside. Take another bowl, beat sugar n egg until smooth n fluffy, then add yogurt n olive oil beat for another 1 minute and stir in orange juice n orange zest. Now add the dry ingredients to the egg-orange mixture and mix well. Grease a 5x8" loaf pan with non stick cooking spray or oil, pour the batter in to pan and bake for 30-40 minutes or until an inserted knife or toothpick comes out clean. Once done remove from the oven, allow to cool for 10-15 minutes then cool it completely in a wired rack. After cooling, slice it n Enjoy! If u want, can add 1/2 tsp Vanilla also. I baked the cake in 350 degree Fahrenheit for 25 or 27 minutes, oven temperature may vary, so keep an eye. Slice the cake once it cool down completely, to get a perfect slice. If u like, dust the top with icing sugar or top it with some desired glaze, but this cake tasted so delicious without any toppings. If u want u can also add 1/2 cup of any desired chopped walnuts or dry fruits/tutty fruity etc. Sending this to Vardhini's Bake Fest now happening @ The Mad Scientist's Kitchen. Moist and delicious..love the flavour and colour!lovely cake..
Wow beautiful color and texture. It surely is healthy with no butter and a very little olive oil. Perfectly baked bread.. Looks so soft.. Will try this sometime. Fluffy and spongy cake..Like to have a bite..
That looks such yummy bake .. love the clicks.. If I was not weight watching I would have loved to bake this cake. What a super moist cake,love the beautiful clicks!! I always enjoy loaf cake specially when it has citrus in it! Hello -- I'm not sure if I can get my hands on yogurt curds around here...do you think subbing Greek yogurt would work? I'd love to try this delicious looking loaf! Looks inviting and colorful :). yummy beautriful color..Delicious texture dear,inviting clicks too!! lovely! 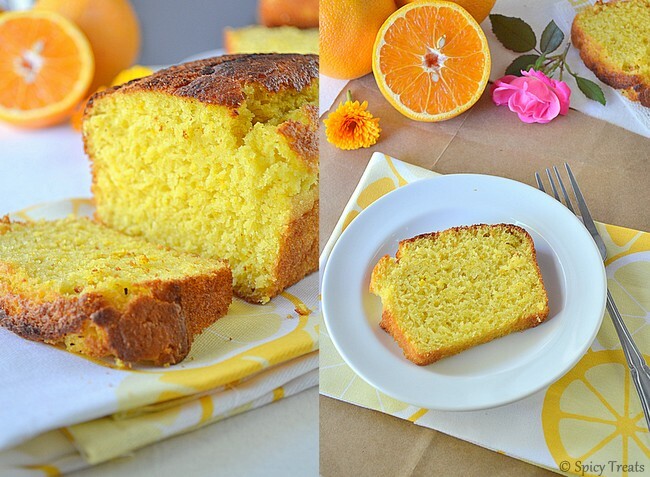 i love citrus cakes!iv never tried with orange. only with lemon! mayb will try urs soon! wow perfect and so soft cake.. nice clicks..
Cake looks super spongy;moist and prefect. Loved that you prepared this cake with olive oil..
Hi! I was looking for a low-fat orange cake recipe that didn't yield huge quantities when I came across your blog. I just tried your recipe and it came out great. Just that it requires more sugar, with all the flour and the tanginess from the orange zest the sugar gets overpowered. I also added nuts and it gives a good taste! I think i might have left it in the oven for a tad bit longer because my bottom came out crusty. Overall it's a keeper with just some minor modifications. Thanks! Thank you so much for taking time to share your feedback here, yes.,adding nuts will give nice crunch and taste to the loaf cake. sure adjust sugar or zest to your choice. Hope you get it perfect next time. You can use egg replacer or instead of oil use butter and replace sugar with condensed milk. I haven't tried this recipe without egg, just giving you some options and hope it works.